Hearing aids help make life happier and safer for those with hearing loss. When your device isn’t working properly, it makes activities and social outings less enjoyable. If you’re new to wearing an assisted listening device, you may be unsure whether there’s a problem with your hearing aid or how you’re using it. 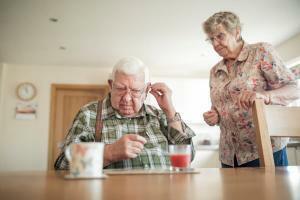 Let the hearing aid repair specialists at The Hearing Group help you figure out what’s going on. This may be due to a loose connection, earwax clogging the tube or a poor fit. You may be able to tighten, clean or adjust the device to fix it. If not, let our hearing aid repair team take care of it for you. To avoid costly repairs, consider getting small defects fixed immediately. You can order extra tubing if you’re confident you will be able to replace it. Many wearers find it less stressful to bring their device to The Hearing Group for a diagnostic and repair estimate. Many times we can fix it while you’re here. If our hearing professionals can’t repair or replace the parts you need, we can ship it to the manufacturer and it will be returned within a few weeks. Keep in mind that our hearing aid repair team makes every effort to repair your device on-site so there’s no delay. When you come in to pick up your hearing aid, ask our audiologists for tips on how to keep the hearing device new and in working condition. The Hearing Group’s helpful staff doesn’t want you to miss a single sound. Call The Hearing Group in West Orange, New Jersey, at (973) 542-4031 to verify whether your hearing aid is working normally. Our hearing aid repair specialists may be able to restore full functionality or send it to the manufacturer to fix it for you.